The boardroom in the Rainbow District School Board Centre for Education has been named in memory of Ernie Checkeris. From left of photo, Muiriel MacLeod Checkeris, Frank Benish and Vicki Kett, who served as trustees together, attended the dedication. During the tribute, Board Chair Doreen Dewar called Ernie Checkeris “a pillar in the educational community, locally, provincially and nationally.” A Trustee with Rainbow District School Board, the former Sudbury Board of Education and its predecessor boards for 55 years, Ernie Checkeris has the distinction of being one of the longest-serving trustees in Ontario. Rainbow District School Board held its first meeting in the Centre for Education on Wembley Drive on Tuesday, November 21, 2017. The historic occasion was marked by an Indigenous ceremony, the naming of the boardroom in honour of a long-time Trustee, and a special presentation by a former Principal of Wembley Public School. Elder Julie Ozawagosh delivered the traditional opening with Gimaa Steven Miller of Atikameksheng Anishnawbek. Chop Waindubence, an Aboriginal Support Worker with the Board, and Bob Goulais provided singing and drumming as the flag of the Anishnawbek Nation was carried in. The flag is being displayed with pride in the boardroom. A smudging ceremony took place earlier in the day. 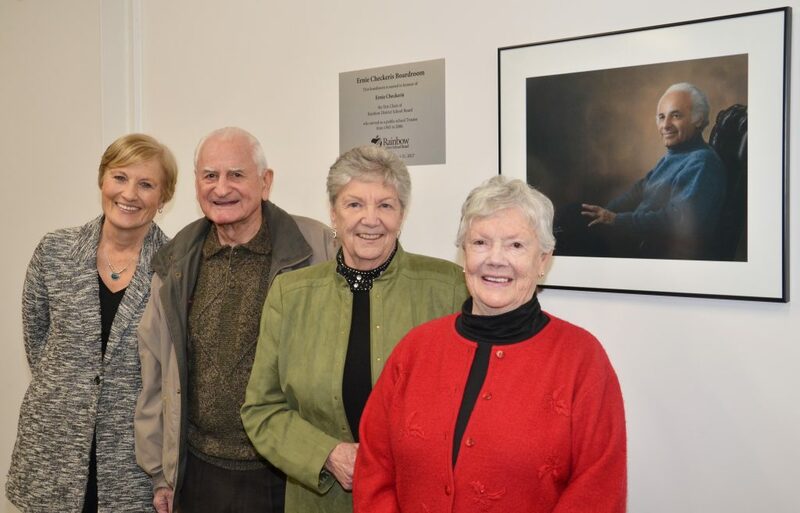 Following the traditional opening, the boardroom was named in memory of long-time Trustee Ernie Checkeris. Muiriel MacLeod Checkeris, Vicki Kett and Frank Benish, who served as trustees together, attended the dedication. A Trustee with Rainbow District School Board, the former Sudbury Board of Education and its predecessor boards for 55 years, Ernie Checkeris has the distinction of being one of the longest-serving trustees in Ontario. The Rainbow District School Board Centre for Education is housed in the former Wembley Public School, which opened in 1944. Jim Sutherland, the second longest serving principal of Wembley Public School, presented the original school bell to the Board. “The bell was used to summon students from the playground to class for many, many years,” he said. Ernie Checkeris became a Trustee in 1945 in the days of one-room schoolhouses. He was a member of the Public School Section of the Unorganized Township of Dryden, in the Village of Wahnapitae. He was elected to the Sudbury Board of Education when it was formed in 1969 through the amalgamation of 36 smaller school boards from across the region. Ernie Checkeris held the position of Chair many times throughout his tenure as a Trustee. When the Espanola, Manitoulin Island and Sudbury Boards combined to become Rainbow District School Board in 1998, he was the first Chair of the new Board. He served on the Hall-Dennis Commission that created the document “Living and Learning” which called for broad educational reforms. In recognition of his outstanding contribution as a Trustee, the Sudbury Board of Education renamed a school in his honour in 1989. Over the years, Ernie Checkeris was an important part of the evolution of education from the advent of computers and co-operative education, to the introduction of French Immersion and School Councils. He retired as a Trustee in 2000. After his retirement, he served as a member of the School Council at Sudbury Secondary School for many years. Ernie Checkeris believed that the public school system, with its principle that every individual be provided with equal access to educational opportunities, regardless of gender, race, religion, ethnic origin, disability and place of residence in Ontario, was the key to teaching understanding of one another in a free, democratic society, as well as the many skills for active participation in family, community and industry, in provincial, national and global settings. He was fond of quoting a staunch supporter of public education who said, “Never lose sight of the fact that the child as the learner is not only the centre of the system, but the only reason for its existence.” He beckoned graduates to “honour your teachers and be courageous in all that you do. The world is at your feet.” He shared his musings from the Chair in bi-weekly columns published in The Sudbury Star. In addition to his work at the local level, Ernie Checkeris played a leadership role among his elected peers. He was a past president of the Northern Ontario Public School Trustees’ Association, he was instrumental in the formation of the Ontario Public School Boards’ Association, and he represented the province on the Canadian School Boards’ Association. He was the recipient of many awards and honours, including the Order of Ontario (2000), Community Builders Award of Excellence in the Education Category (2004), a Queen’s Golden Jubilee Medal (2003), the Fred Sheridan Award presented by Cambrian College (2002), the Paul Harris Fellowship presented by the Rotary Club of Sudbury (1996), the OPSTF Meritorious Award (1990), the FWTAO Citation (1989), the OSSTF Lamp of Learning Award (1988), and the Sudbury Board of Education Award for Excellence (1987). Ernie Checkeris was granted an Honorary Doctor of Canon Law from Thorneloe University at Laurentian where he was a founder, former Chancellor and long-time board member. The theatre at Thorneloe was renamed in honour of Ernie Checkeris in 2011. Ernie Checkeris passed away on October 6, 2014, leaving a lasting legacy to public education. The Rainbow District School Board Centre for Education is housed in the former Wembley Public School, which opened in 1944. 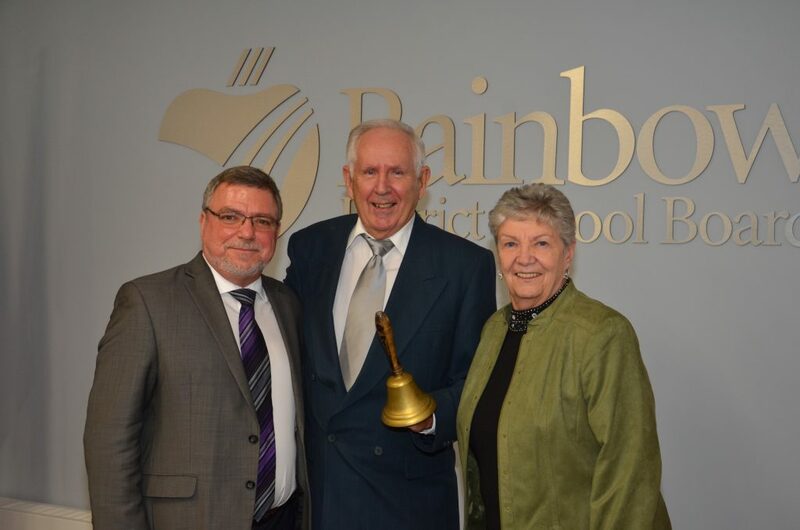 Jim Sutherland, the second longest serving principal of Wembley Public School, centre, presented the original school bell to the Board, including Chair Doreen Dewar and Director of Education Norm Blaseg. 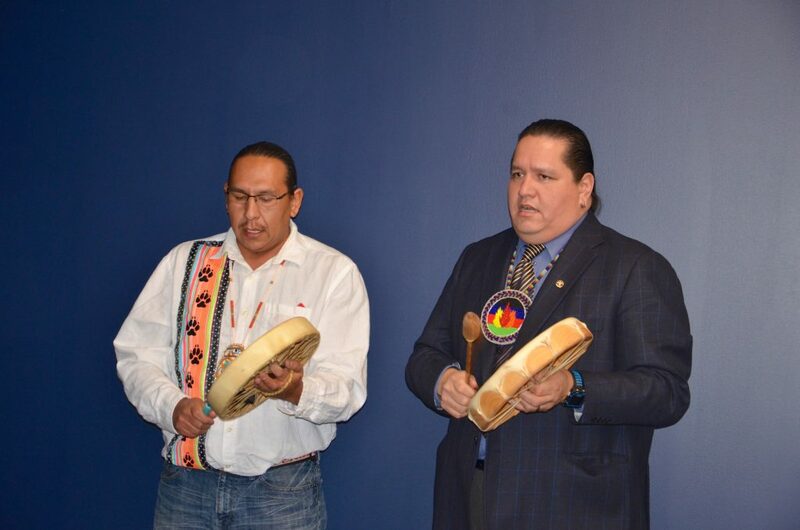 Chop Waindubence, an Aboriginal Support Worker with Rainbow District School Board, left, and Bob Goulais provided singing and drumming during the Indigenous ceremony. Rainbow District School Board held its first meeting in the Centre for Education on Wembley Drive on Tuesday, November 21, 2017. The historic occasion was marked by an Indigenous ceremony. 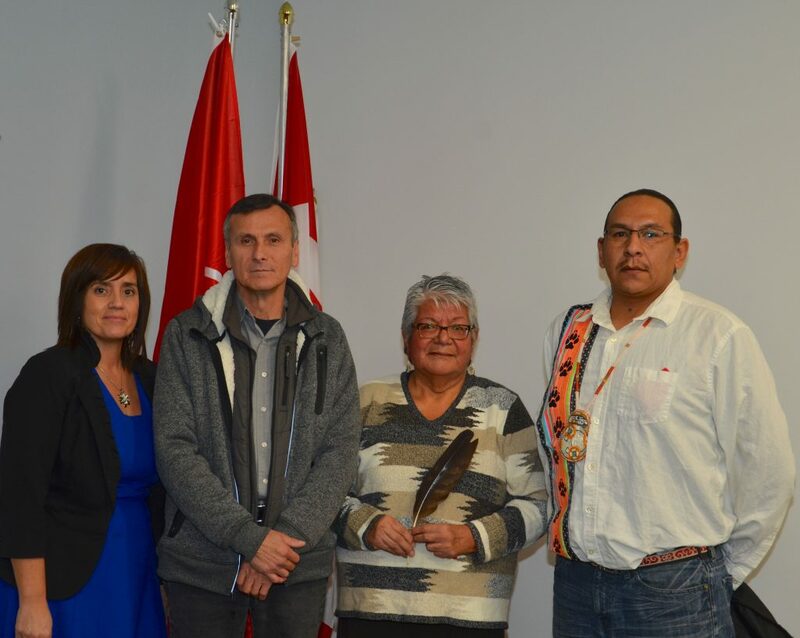 Kathy Dokis, Principal of Indigenous Education, left, joins Gimaa Steven Miller of Atikameksheng Anishnawbek, Elder Julie Ozawagosh, and Aboriginal Support Worker Chop Waindubence. The flag of the Anishnawbek Nation is proudly displayed in the boardroom.